The lithographic representation of photographs makes the T206 set a colorful illustration of players from a bygone era. But, T206 cards acquire a special vitality when they capture a player’s signature on his card. A signed T206 card brings the holder back in time, not only to when the player took the field, but also to when he held that card and signed his name, giving the card an incomparable personal touch. 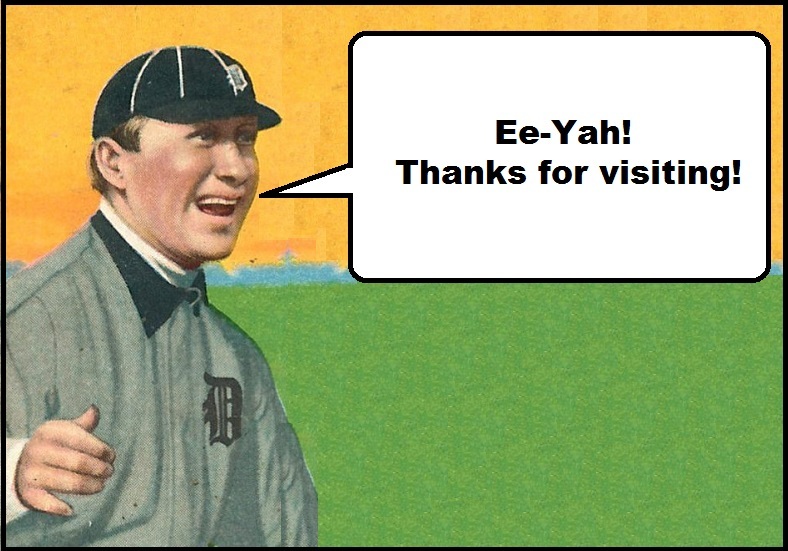 CLICK HERE to see scans of my signed T206 collection. A lot of suspicion with respect to the authenticity of signed pre-ward cards is driven by the experience of hobbyists, most or whom never even heard of or saw authentic signed pre-war cards being discussed in any public hobby magazine or forum until the last 10 or 15 years. So, with a lot of help from fellow hobbyists, I have been reviewing dozens of old hobby publications from the 1950s and 60s to try to uncover some evidence of their existence. Click the image above to read all about it! Boston Red Sox pitcher Babe Ruth began his home run-hitting career in a game on May 6, 1915, against his future team, the New York Yankees. A crowd of about 5,000 visited the Polo Grounds for an American League matchup between the two rivals. Ruth was the starting pitcher that day, and the Yankees countered with Jack Warhop. Ruth came to bat against Warhop in the third inning. According to a Boston Globe article about the game, “Ruth, who impressed the onlookers as being a hitter of the first rank, swatted a low ball into the upper tier of the right-field grandstand and trotted about the bases to slow music.” Although Warhop pitched 8 seasons for the Yankees, he will always been known for serving up Ruth’s first home run – and, for his beautiful signing of this T206 card! The M116 Sporting Life Wagner is, quite literally, the mirror image of its contemporaneous T206 brother -- a reflection not unlike that cast from a still pond on a cold winter's day. The cardboard itself was less objectionable to its subject because it was not packaged with a tobacco product, and therefore far more common in terms of overall scarcity. However, this particular M116 contains the steel-tipped fountain pen signature of the "Flying Dutchman" himself, giving this 100-year old piece of cardboard a unique and incomparable personal touch unavailable on any surviving copy of the ultra-desired T206 example. I may never be able to own even an unsigned T206 Honus Wagner, the price being too high for any reasonable wallet to part with. But, this T206-mirror image, with Mr. Wagner's name scripted by his own hand, certainly fills a hole in my signed pre-war card collection incapable of ever being filled with a signed (or unsigned) T206 Wagner card. I've been collecting baseball cards for 30+ years, and signed pre-war cards for over 10 years. In that time, I've acquired over 40 different signed T206 cards. And yet today I am sharing the best single acquisition I have ever been part of, four signed pre-war cards all coming out of the same truly amazing autograph collection. I had the once-in-a-lifetime opportunity to pick up two new signed T206s -- Nap Lajoie and Frank Baker -- as well as a stellar Sam Crawford, including the date in 1957 that Crawford was elected to the HOF by the Veteran's Committee. But, the most important card I received was a signed M116 of Honus Wagner. Obviously, I'll never own a T206 Wagner (let alone a signed one), so this will have to do as a suitable replacement. Signed 1911 OBAK of the 1925 A.L. MVP, and reigning World Champion shortstop for the Washington Senators, Roger Peckinpaugh! "I WISH I LOOKED LIKE THIS PICTURE NOW!" An amazing collection of over 50 signed Sporting News Supplements (M101-2) came to auction in May 2015. The collection comes from the family of Dr. Clarence G. "Doc" Steen, who was a dentist in Scottsbluff, Nebraska. Over 70 years ago, Doc Steen had the foresight to have as many players as possible sign these old supplements. I have been fortunate enough to acquire 17 of these unbelievably fragile rarities, highlighted by a beautifully signed Tris Speaker. If you managed to land any of the balance from this collection, I am always looking to add to it! Thanks to Chuck K. for letting me pry this pair of ultra-rare signed T201 Mecca double-folders from 1911 from his collection. This is the first time I've ever owned a signed pre-war card of "Hans" Lobert. The only other one I'm even aware of is a signed T206 from the Morey collection, which was sold at auction into a private and unknown collection in 2001. BUY ME SOME PEANUTS AND . . .
1914 Cracker Jack signed by Hall of Famer "Rube" Marquard. Note the team: "Brooklyn - Federals." This is a reference to the short-lived Federal League, Few people realize that Wrigley Field was originally built for the Chicago Whales Federal League team, before being adopted by the Cubs as their home. Signed Cracker Jack cards are exceedingly rare, and this example was boldly signed across his chest--almost like it was meant to be there from the card factory. This amazing signed T202 card of Fred Snodgrass represents a recent addition to my signed pre-war card collection. This represents one of only a handful of known signed T202 cards, and was just added to the hobby as part of a mixed lot of pre-war cards during a recent auction. The winner broke the group up, and sold the "Sno" on ebay a few weeks later, where I snatched it as soon as it became available! Too bad he signed it over his face, but I guess he felt pressed by the facsimile signature at the bottom, and didn't want to sign over McGraw, Davis, or Murray, also featured on the front. Click the above image to see cards from Jefferson Burdick's collection, which he traded or sold before donating the balance of his enormous hoard to the Metropolitan Museum of Art in New York City. How do we know they were his? Because he stamped his name on them. Click HERE to learn about this great find! A bi-monthly publication on the autograph hobby with an in depth look at collecting pursuits is available for $14.95 a year by writing to Morey at 305 Carlton Road, Syracuse, NY 13207. Back issues are also available -- eight random issues for only $9.95, plus $3.00 postage and handling. Morey has been publishing "TAR" for over 30 years and has never missed a date.